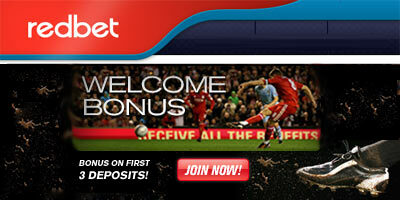 Betting exchange Redbet was formed in 2002 by the group of Swedish businessmen. Redbet has been online since 2004 and is currently licensed in Malta, where is regulated by Lotteries and Gaming authority (LGA). Redbet.com also offers its players a casino and two poker rooms. The online casino is provided by the Net Entertainment Ltd. platform while the poker rooms are provided by the B2B Poker Network and Boss Media platforms all licensed in Malta and offering state of the art technology and a very high quality experience to their players. It couldn't be easier to get the bonuses, all you need to do is to enter the codes in the bonus field when you make deposits and place a bet at odds 1.5 or higher and the bonus will be credited to your account right away. Open a new account with Redbet !! "Redbet sportsbook review: one of the best in fixed odds and live betting"